Below is my version of a warming, restoring, folkloric immunity tonic. It is spicy, sweet and sour. I started making it some years ago after a few bouts of serious winter illness that always seem to settle in my lungs; but this tonic is not just for winter. In our house, we take it year round. Honestly, a shot of it feels so healing. A few years ago I was experimenting with drinking vinegars, shrubs and fermented fruits for my blog Hungry Ghost Food and Travel which inevitably led me to this tonic. For a long time I didn’t integrate what I learned as a kid growing up on a small family farm into my life in New York and then slowly over time I started to see these movements here that were so familiar. I began to return to my roots, one of gardening and canning and pickling and making home remedies. Growing up in Western Mass in the late 70’s, I was no stranger to this way of life. The vibe in the area was an interesting mix of conservative yankees and ex New York liberals who became the next generation of back to the land hippies. My stepmother was an avid gardener and self taught herbalist, as were most of the women in my neighborhood. They all had amazing herb gardens, they got together occasionally to share plants and seeds. I first read about the concept of healthy drinking vinegars and fire cider in a book she had; it was Rosemary Gladstar’s Herbal Recipes For Vibrant Health. I revisited Rosemary’s book when I was making shrubs. This more curative vinegar based tonic was a natural progression as I began to look at food as medicine. Rosemary first made a version of what she called fire cider in the late 1970’s when she was teaching at the California School of Herbal Studies. I like the word folkloric to describe this tonic because it is something that has been passed down through may cultures and many generations, through spoken word. It has many incarnations and no one really knows when or where it started, but most cultures have a version of a healing vinegar tonic. The amazing thing about a recipe like this, is that it is not a recipe at all; just a set of guidelines, notes a friend might pass to you to do with it as you wish. It belongs to no one. My version has morphed and changed with time and place. The current mood it takes on is the local terroir of upstate (where I forage for anything and everything) as well as the flavors and inspirations of my travels. The basic ingredients in this tonic are; vinegar, ginger, turmeric, garlic, horseradish, onions, lemons, chilies and honey. I add dried sumac, rose hips, pine and hibiscus for an extra boost of vitamin C and always extra turmeric and black pepper for anti inflammatory properties. In my last few batches I have been adding bee balm, fennel pollen, cranberries and a bit of bee pollen.I sometimes mix young ginger with mature ginger. You get the idea. Once you have the base you can really experiment. Gathering all your ingredients for this health tonic is almost as fun as drinking it. Before you start chopping and grating, take a moment to revel in what you have gathered. I have started growing horseradish and turmeric in pots in my kitchen. They are surprisingly easy to grow and are both such pretty plants. I don’t grow near enough for the amount I need to use, but it makes me feel good to grow plants I can use for health and wellness in my New York City loft. If you start making this in big batches you may want to search out a farmer who grows turmeric, ginger and horseradish. It can get a little costly if you buy from health food stores or larger grocery stores. I started sharing half a case of fresh turmeric and young ginger a couple years ago with my friend India. We order it in the early fall. It comes from a farm in Western Mass. but now, more and more, people are growing ginger and turmeric and you can probably find them at the farmers Market. Last year, I cheated a little and instead of getting a large knob of horseradish root, I picked up some freshly grated horseradish at a market in Pennsylvania. There are quite a few farms around Lancaster that are growing delicious horseradish. I Didn’t notice any difference in using freshly grated or the pre-grated horseradish, so I would say do what is easiest. You might not want to spend the time chopping and grating it yourself. This year I am adding some deep red hibiscus from a trip to Oaxaca and some dried rose hips and sumac from upstate as well as some rose petals from Pushkar. I am always on the lookout when I travel for easy things to bring back and they inevitably end up in my cooking. Ingredients and market hunting are at the crux of what inspires me. Salt, honey, dried flowers and spices are high on that list. I hit the market wherever I am traveling first thing and if I know I will be cooking, I often travel with spices I cant live without. I don’t want to scare you off with all the foraged and stowed travel bits , because you can jazz this up or strip it back to just the key ingredients, so I will just stop here. The items with an asterisk are optional and in the end I want you make it your own! You will want to make a BIG batch because once you share it with friends they are going to be asking for more. You might want drink it at the first sign of feeling a bit of a cold or sore throat or you might want to take shot everyday as preventive. Makes approximately two gallons. Takes 4-6 weeks to mature. Make it now to combat that New Year Hangover or that inevitable winter chill. The most basic recipe is below. The add ins are just for fun and you shouldn’t feel worried or intimidated if you cant find or don’t have any or all of the add ins. 20 1 inch nubs of fresh turmeric (finely chop) buy turmeric root at your local health food store Whole Foods or farmers market. Turmeric is insanely good for you so don't worry if you cant measure 20 one inch nubs exactly . A little more wont hurt. * You can used dried turmeric if you cant find fresh. Substitute 6 tablespoons dried turmeric. Chop ingredients, measure lemon juice, salt and cracked pepper and any add ins if you are using any. Add all your chopped and dry ingredients together in a large glass bowl. Top each jar with 6 cups of organic apple cider vinegar. Cover the top of the jar with baking paper or cheese cloth before screwing on the metal lid. The metal will corrode if you don't. Place the jars in a darkened, room or cool pantry for one month. Periodically turn the jars gently. Strain the tonic it into a large bowl or pot and give your Mason jar a quick rise. Pour the strained tonic back into a clean Mason jar. Repeat this process for all 4 jars. Your tonic should be spicy and sweet but not overtly sweet. Refrigerate or keep in cool dark pantry and decant into a smaller bottle for easy access. Take daily or when you are feeling little less than stellar. Staghorn Sumac is just one of the North American edible Sumac's that closely resemble the tangy lemony, terra cotta colored spice from the Middle East. There are hundreds of varieties and all with red berries are edible. It grows wild and prolifically all over New England and Upstate New York. In fact, I am pretty sure it grows all over the Northeast. There are a couple varieties you might spy while whizzing down the highway, as it likes to grow along the road's edge. I prefer to collect Staghorn Sumac which has an almost tropical look to the vibrant, red, cone like berry clusters. The leaves turn a brilliant red in the fall. I gather Sumac in more remote areas along slow country roads or the edges of farms, even in a friend's yard where one tree I know of grows 30 feet high. When I mention Sumac, people often assume I am talking about Poison Sumac. The edible variety is completely different from its poisonous cousin - which has white berries - and is not poisonous at all, The berries of Poison Sumac cannot be mistaken for Stag Horn Sumac. The moment is NOW to harvest! I keep clippers in the pocket of the door of the car, so I am at the ready when I spot some. Harvest Sumac when the cone like clusters are vibrant and full and the little hairs that envelope each seed are intact. Rain can sometimes wash them away and If you wait too long to harvest they may get buggy. In New York and New England I harvest anywhere from late July to early September, depending on the weather. Keep your eye on the sumac and you will learn to know when it is mature. Clip Sumac clusters just below the end of the cone. Leave the whole clusters to rest in a dry space for a couple days. You want them to be dry when you process so nothing molds. Rub your hands over the hairy red clusters and the small individual berries will fall away onto sheet tray below. Don't worry if there are some larger pieces or bits of twig and leaves, it will all get sorted later. Leave the hairy little sumac seeds on a sheet tray for 24 hours in a thin layer. Fill your spice grinder about half way with the sumac seeds. Pulse a few times until it seems the hairs have separated from the seed. Your grinder will not grind up the actual seed, it is to hard, but it will separate the little hairy layer from the seed. 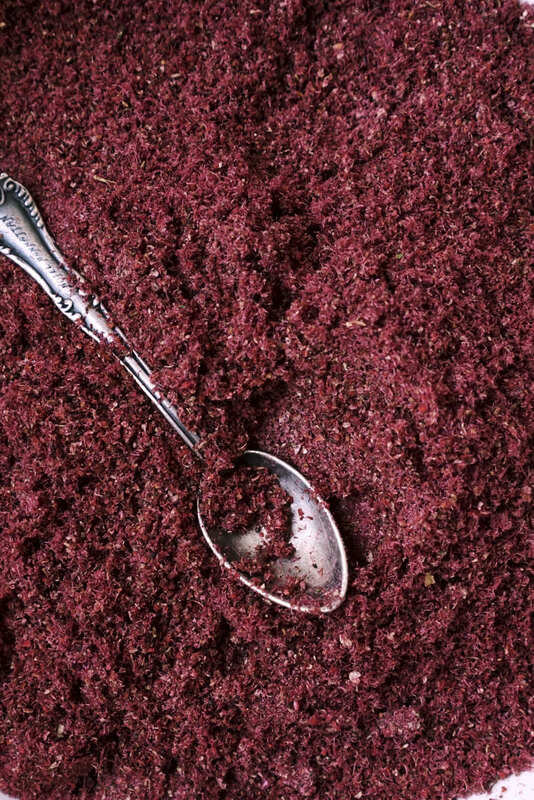 Pour the ground sumac into a a medium sieve and shake over a bowl until you have separated the hairs from the seed. Discard the seeds. Repeat until you have processed all your Sumac! Lay your ground sumac out on a large sheet tray for 24 hours to make sure it drys or if you have a microwave you can give it a quick zap. I don’t use microwaves but I have heard the method works well. Alternatively you could throw it in your oven at at 140 degrees overnight. I am into minimal work so I leave it on sheet tray in a nice dry spot and forgo the oven and microwave method. Store the sumac in an airtight jar in your pantry. It will last indefinitely. Below; Greecologies thick tangy yogurt, Dan Finn's maple syrup, wild fennel pollen foraged from the Sonoma Coast, pickled rose petals and a squeeze of lime. I have been using a lot of rose in my kitchen lately. The smell of wild roses takes me straight back to the summers of my childhood where we spent a few precious days each year in Watch Hill Rhode Island where the shores were thick with rugosa and the air smelled of salt and rose. One of the very old houses I lived in on the Massachusetts Vermont border was surrounded by a thicket of rose. Many different varieties grew together in a tangled mass. I am sure some of them were planted purposefully over the years but by the time we moved in, both the house and the grounds had gone a bit wild. I like to imagine, that over the centuries, some of the women who had lived there were as obsessed with rose as I am and perhaps they used them for tea or cooking or for scents. The house had a long and rich history as the first post office in the town and it was said that the house harbored a spy during The French and Indian wars. Some of its former inhabitants still walked the halls when I lived there, shimmering lightly as they moved furniture and knocked things akimbo in the night. It is no coincidence that when we bought property upstate one of the first things we planted was roses, not perfect long stem roses, but the kind that grow without much care into wild blustering bushes, thick with single petal flowers and thorns. We also rescued roses from a nearby farm that was being leveled and torn down, we call these Edgar’s Roses. Over the years our rose bushes have been good to us and this year is no exception. We never spray them. When using rose for food you always want to make sure they have never been sprayed and are pesticide free. throw in some whole buds, they are very beautiful when pickled. Submerge the petals in a bowl of water then drain lightly and lay out to dry on dish towel. you want to bruise the petals as little as possible. In a non reactive sauce pan, heat the vinegar, the salt and maple to just a simmer. Turn off and stir until the salt and maple are dissolved. Let cool about 10-15 minutes. Place the rose petals in a large glass bowl and pour the cooled liquid over the roses. Store in a ball jar in your refrigerator. infuse for a a few days or so before using.The pickle will last for several months.The color will slowly fade and transform over time from a vibrant pink to a dusty brown pink. The pickling liquid will either be a vibrant pink or a brown pink depending on if you use maple or sugar. You can use this sweetened rose vinegar as you would any vinegar and use the pickled petals to accompany roasts or morning yogurt. SEE MY ROSE PETAL FRENCH TOAST HERE AND MY ROSE PETAL ICE CREAM HERE. WHERE THE WILD THINGS ARE. 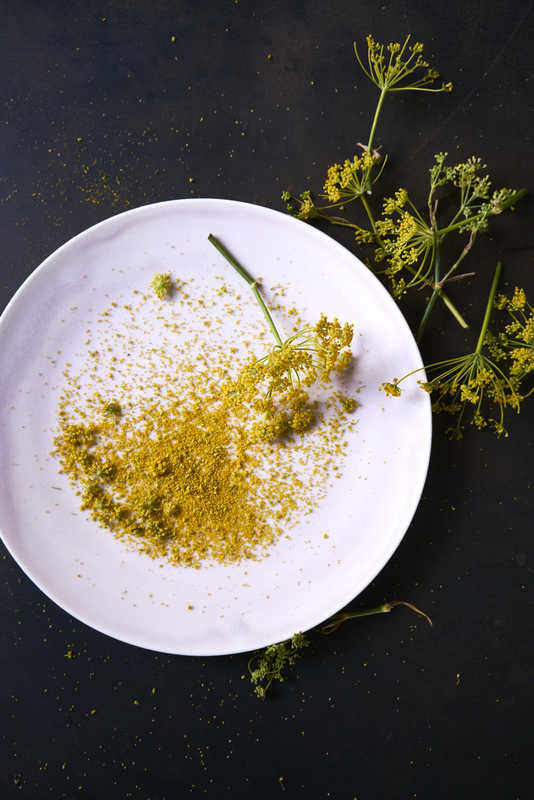 WILD FENNEL POLLEN. PART ONE. Northern California smells good. Yes, I know I am making a broad sweeping statement–but it's true. Everytime I am out here, no matter the time of year, the thing that resonates is the smell. Sometimes, briny, smoky and woodsy, heavy with eucalyptus, pine and sage brush other times sweet with wild fennel and dark summer fruits. Wild fennel grows everywhere in Northern California; A beautiful weed feeding off fog and salt in the dry dusty soil and craggy rock along the highways and oceans edge. Fennel pollen is used in many Mediterranean recipes. Right now, it is in full bloom. Bright yellow clusters heavy with pollen. This year, the drought has given way to a particularly abundant crop. I fight the bees just a little for the flowers which I cut off in clusters. I cut only the ones fluffy with pollen, in the late afternoon after the sun has dried the residual morning dew. The pollen has buttery delicate fennel taste and slightly caramelized aroma. - Cut the flower clusters in the late afternoon. - Make sure they are dry, if not leave in the sun for an hour or so. - Process the pollen by rolling the flowers gently between my fingers over a large plate or sheet tray. Don't worry if some of the flowers fall into the bowl. You will later sift out any big peices. - Once you have processed all the flowers smooth the pollen out in a thin layer and leave somewhere out of the wind to completely dry.This can be an hour in the sun or overnight in indirect light. The fennel flowers can become a bit sticky or a little wet during the rolling processes they release amy moisture or sap. - When dry sift through a fine sieve into a bowl. Only the pollen will remain. During the drying process it will go from a bright turmeric yellow to a more burnt turmeric. I sifted mine twice through two different size sieves, I used a medium sieve for the first round and a fine sieve for the second round. Your sieve should sift out all the debris and from the pollen. If this is not the case, use a larger mesh sieve. Store in a ball jar or a well sealed spice tin. This will last up to one year if completely dry. If you are not fortunate enough to live on the West Coast where this grows abundantly wild, you may be able to find it at your local farmers market. It looks a lot like dill flower so ask the farmers. I spotted some at the Union Square green market yesterday. Or perhaps you have planted some in your garden and have let it go to flower? Fennel pollen is also available at most spice markets and many food specialty shops. Recipes to follow in part two. My mind is dancing with ideas. Thanks for the initial inspiration Samin! MAISON BERGOGNE + FISH AND BiCYCLE. On a recent trip to Delaware Country we took a little detour off Route 17 and skirted around to the tiny town of Narrowsburg in Sullivan Country to visit with Laura Silverman and her business partner Juliette Hermant. We have known Laura for some time and are long time fans of her blog, Glutton For Life. It was our first time meeting Juliette and what ensued was a charming and organic few hours of cocktails, foraging talk, and portrait making! 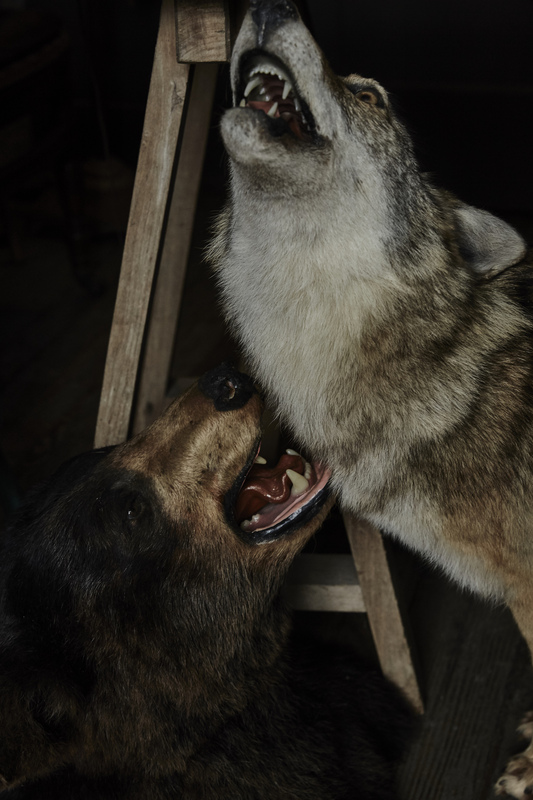 The two are partners on the up and coming Fish and Bicycle bar and restaurant, which will be housed within Maison Bergogne, Juliette's incredible antique, found objét and salvage shop, an old bus depot. It is a little Vide-Grenier, a little French Flea and a whole lot of Catskill's. Juliette's perfect curations and curios perfectly match Laura's insanely delicious cocktails. I can't wait to visit with these ladies again soon and wait... did i mention their personal style? FROM THE ARCHIVES.WHERE THE WILD THINGS ARE. DANDELION BUTTER. FRITTATA OF THE THINGS WINTER LEFT BEHIND. DANDELION BUTTER AND FRITTATA OF THE THINGS WINTER LEFT BEHIND. It has been a while since I have been upstate. Work has kept me traveling and while that has been nice I have been missing my wild adventures in Upstate New York. This has been a busy year and much has changed. I looked back to see what I was up to this time last year. Dandelion butter and wild frittata's and weekend's with friends are are what came up on the blog. They are what I have been dreaming about this week as the sun is finally shining here in NYC and I get a few days to head up to the mountains. Though the below post was exactly year ago it feels entirely apropos. I thought I would re-share with you. COPIOUS PILE OF WILD ORGANIC GREENS SUCH AS DANDELION,MINT, MUSTARD, SORREL AND SPRING GARLIC. 1/2 CUP PLUS A BIT MORE OF A VERY GOOD OLIVE OIL. PREFERABLY A DARK LUSCIOUS GREEN ONE. This beautiful vibrant yellow butter is all about early Summer. As kids we ran around with a fistful of dandelions and thrust it under anyone's chin we could find yelling do you like butter!? yes! you like butter! The yellow reflection of the petals was meant to be sign that said participant did indeed like butter. It is from the memory of that adventure that this idea was born. Pulse on high speed for two minutes or so until the solids start to slap the sides of the processor and clearly separate from the liquids. Holding the butter in place tip the processor to drain off the excess liquids. Passion fruit is my go to winter fruit to make me feel as though I am someplace tropical. 1/2 cup mixed seeds—Sunflower and Pepitos 1 tbsp. In a cast iron pan over low heat, toss the seeds in 1 tablespoon of coconut oill and a pinch each of crushed chili flakes and kosher salt. Scoop 1/2 of the passion fruit into each bowl. Top with the warmed seeds, pistachios, and drizzle with Manuka honey. Finish with the lightest hint of Black Crete Sea salt.